Experimental study of the fluoride ion importing diminished the occurrence of microleakage after root canal filling. 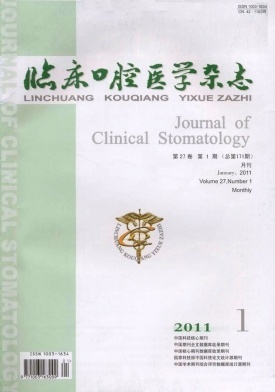 ZHANG YU,JIA Xiao-wei,FAN De-xin,PANG Guang-ming.1.Department of Stomatology,Congming Hospital,Xinhua Hospital,Shanghai Jiaotong University School of Medicine,Shanghai 202150,China;2.Dongfeng Stomatological Hospital of Hubei Medical College,Hubei Shiyan 442001,China. Construction of three-dimensional finite parametic model of mandible first molar all-ceramic crown. WANG Wei-guo1,ZHANG Shao-feng1,CHEN Jian-jun2,LI Lei3.1.Department of Prosthodontics,School of Stomatology,the Fourth Military Medical University,Shanxi Xi'an 710032,China;2.School of Electronic Mechanical Engineering,Xidian University,shanxi Xi'an,710071,China;3.Unit 65563 of PLA,Liaoning Jinzhou 121100,China. Investigation of the anti-heat aging abilities of three silicone rubbers for maxillofacial prostheses. HAN Ying1,ZHAO Yi-min2,LU Yi1,SHAO Long-quan3.1.Department of Prosthodontics,Medical College of Stomatology,The Xi'an Jiaotong University,Shanxi Xi'an 710004,China;2.School of Stomatology,the Fourth Military Medical University Shanxi Xi'an 710032,China;3.Department of Stomatology,Nanfang Hospital,Nanfang Medical University,Guangdong Guangzhou 510515,China. A study on maxillary growth vector with different sagittal skeletal malocclusion between pre-growth and post-growth spurts. FENG Xiao-xia1,CHENG Qian1,XU Zhen-rui1,TANG Na1,ZHANG Lin-kun2,XU Meng-ting1,LI Wei-peng1,YANG Pu1,ZHAO Mei-ying1,ZHAO Zhi-he1.1.Department.of Orthdontics,West China College of Stomatology,Sichuan University,Sichuan Chengdu 610041,China;2.Department.of Orthdontics,Stomatological Hospital of Nankai University,Tianjin 300041,China. Changes in succinate dehydrogenase gene expression during 4-nitroquinoline 1-oxide induced rat tongue carcinogenesis. GE Shu-yun,LOU Jia-ning,ZHOU Zeng-tong.1.Department of Oral Medicine,College of Stomatology,Ninth People's Hospital,School of Medicine,Shanghai Jiaotong University;Research Institute of Stomatology;Shanghai Key Laboratory of Stomatology,Shanghai 200011,China;2.Department of Stomatology,First People's Hospital,Shanghai Jiaotong University,Shanghai 200080,China. Dentin phosphoprotein in gingival crevicular fluid during early orthodontic root resorption in rats. LI Wen-xing,LIU Yue-hua.Tongji University Sschool and Hospital of Stomatology,Shanghai 200072,China. The clinical and diagnosis analysis of chronic graft-versus-host disease in oral cavity. TAO Ren-chuan1,XIAO Li-ting1,LAI Yong-rong2.1.Department of Periodontics and Oral Medicine,Stomatological Hospital,Guangxi Medical University,Guangxi Nanning 530021,China;2.Department of Hematology,First Affiliated Hospital,Guangxi Medical University,Guangxi Nanning 530021,China. Traditional decoction Wubeizi joint Amlexanax paste local treating the major aphthous ulcer clinical observation. WANG Yue-chun,HUANG Min,CHEN Jian-gang.Department of Stomatolgy,Zhongnan Hospital of Wuhan University,Hubei Wuhan 430071,China. The study of application of platelet-rich plasma in the treatment of periodontal intrabony defects. ZHANG Li,GAO Jing,XIAO Chang-jie.The Department of Stomatology,Central Hospital of Taian City,Shandong Taian 271000,China. Evaluation of the unilateral complete cleft lip and palate patients on the dental arch relationships between upper and lower jaws. AYIGULI ·Tuerdi1,MI Cong-bo2,AYINUER Dawuti3,HAN Rui2,CHEN Liang2,ZHU Ting-ting2.1.Department of Stomatology,The People Hospital of Xinjiang Uygur Autonomous Region,Xinjiang Urumqi 830001,China;2.Department of Orthodontics,the First Affiliated Hospital of Xinjiang Medical University,Xinjiang Urumqi 830054,China;3.Department of Ophthalmology,The Rehabilitation Hospital of Xinjiang People Government,Xinjiang Urumqi 830094,China. Effect of continuous wave obturation technique for curved canals of posterior teeth. JIANG Bo,HUANG Jing,CAO Qian,LUO Dong-yun.Department of Stomatology of Xili People's Hospital,Guangdong Shenzhen 518055,China. The correlation study between clinicopathologic and ultrasonographic features in 105 parotid gland masses. QUAN Hong-zhi1,TANG Zhan-gui1,WANG Wei-ming1,PAN Li-juan2,ZHU Wen-yuan1,LU Ruo-huang1.1.Department of Oral and Maxillofacial Surgery,Xiangya Hospital·School of Stomatology,Central South University.Hunan Changsha 410008,China;2.Department of Ultrasonography,Xiangya Hospital,Central South University,Hunan Changsha 410008,China. Research of treatment effects of reformed pendulum and upper lip bumper therapy on crowed malocclusion in permanent dentition. MU Ming-kui,LU Xiao-li,LIU Yang,ZHAN Wang,HOU Lu.Department of Othodontics,The Second Hospital Affiliate to Harbin Medical University,Heilongjiang Harbin 150086,China.